15 Comments	This post may contain affiliate links. 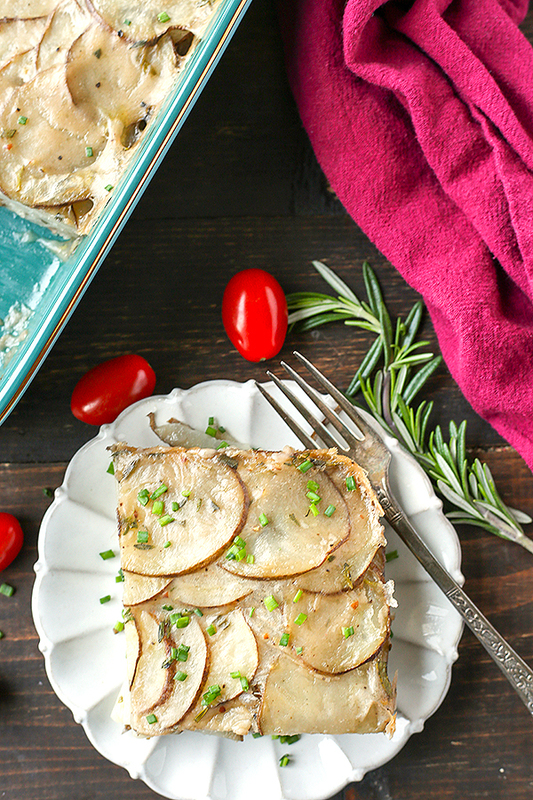 These Paleo Whole30 Scalloped Potatoes have layers of tender potatoes baked in a creamy sauce with fresh herbs. They’re dairy free and gluten free, but no one will be able to tell! 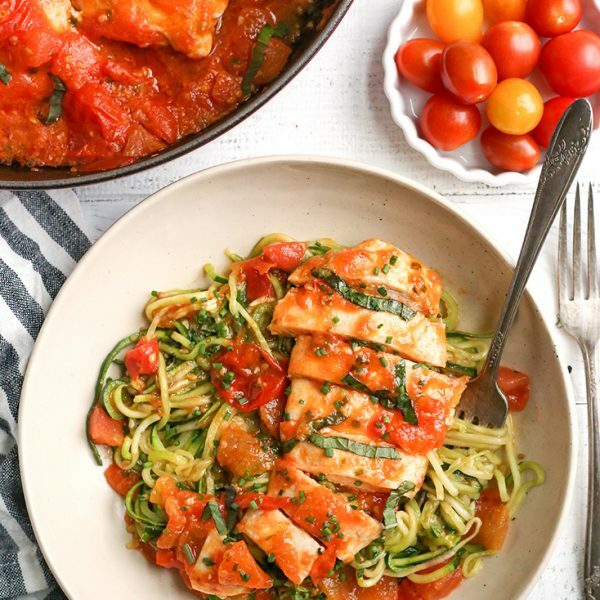 A classic dish made healthier. 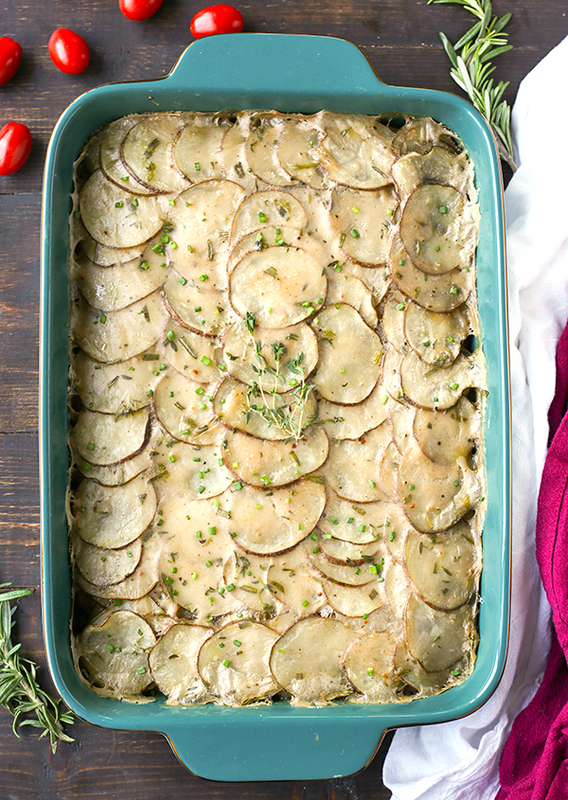 Scalloped Potatoes or Potatoes Au Gratin? I tried to look up the difference and got many different answers, but I think they’re very similar. I did see one site say Au Gratin is covered with cheese and breadcrumbs which ultimately led me to name these scalloped potatoes. These are a holiday staple! I grew up with the box kind so I always thought homemade was hard to make, but they’re not at all! And the result is way more delicious and of course no unwanted ingredients from the box. 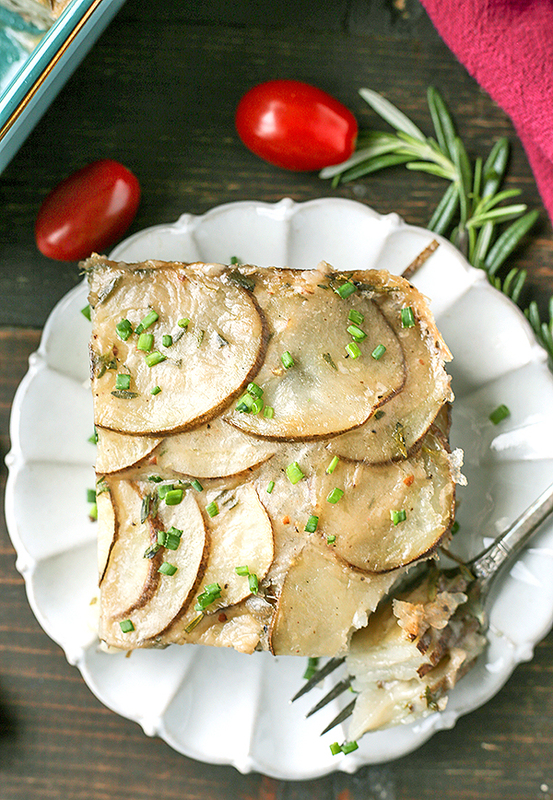 You may not think a paleo whole30 version of scalloped potatoes will be good, but it totally is! The fresh herbs, creamy/buttery sauce, and the garlic oil make it so delicious. I promise you and your family will love this dish and hopefully make it more than once a year. You will need some amazing knife skills or a mandolin slicer for this. I actually don’t use my mandolin a whole lot because I have a fear of slicing my finger and I also hate cleaning it. But it makes this dish so easy. I had all 3 pounds of the potatoes sliced in just minutes. Just a tip- don’t worry too much about the end piece, your finger is not worth it! Just throw it away before it gets too small. If you have a food processor with a slicing blade, you can use that. I used my favorite almond milk, Malk (not sponsored, I just love it!). 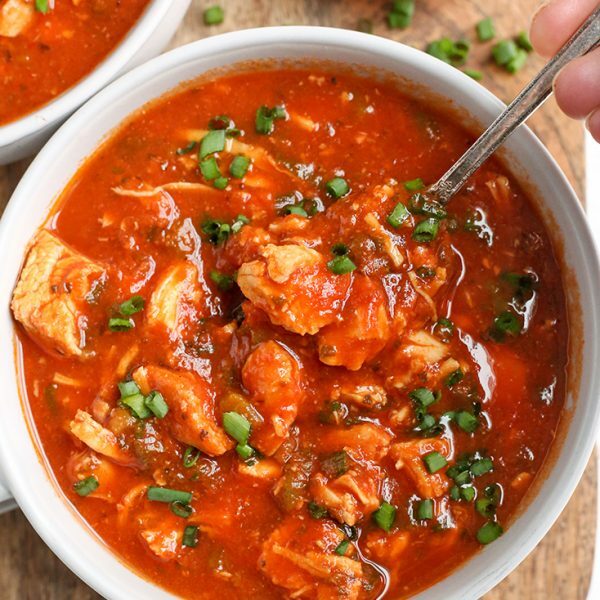 It has no thickeners or weird ingredients and has a decent amount of fat. Just please don’t use those almond milks that are low calorie because they are basically just water. If you need a nut free version you can use canned coconut milk. A tip about the potatoes- I don’t peel them for a few reasons: it saves time, it looks pretty, and the skin has all the potassium and fiber. I hope you add these potatoes to your Easter dinner. 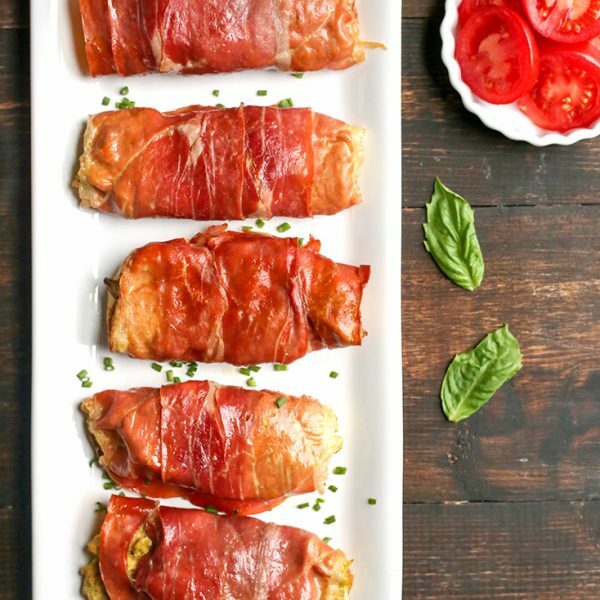 They are full of flavor, rich and creamy, and easy to make. 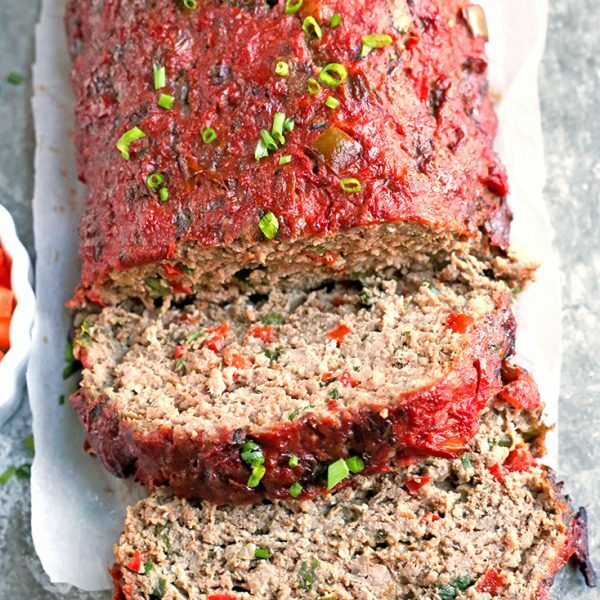 A side dish the whole family will enjoy. HERE is the mandolin slicer I use and have had for years. Preheat oven to 325° and grease a 13x9 pan with ghee or coconut oil. Set aside. Wash potatoes well. Place a mandolin over a large bowl and slice potatoes. Stop before getting to close where you could slice your finger. Alternatively, you can use a food processor with a slicing blade. Make the cream sauce: In a small saucepan combine the ghee and cassava flour until combined and thick. Cook 1 minute stirring continually. Add in the water, almond milk, and garlic oil and whisk until smooth and thick, about 3-5 minutes. Add in the salt, thyme, rosemary and pepper. Whisk again until well combined. Take off heat. Mixture should be thick, but pourable. Add a little water if it's too thick to pour over potatoes. Add a thin layer of the cream sauce to the bottom of the pan and top with a layer of potatoes. You don't need to do single layers of potatoes, about 4 total layers will work. 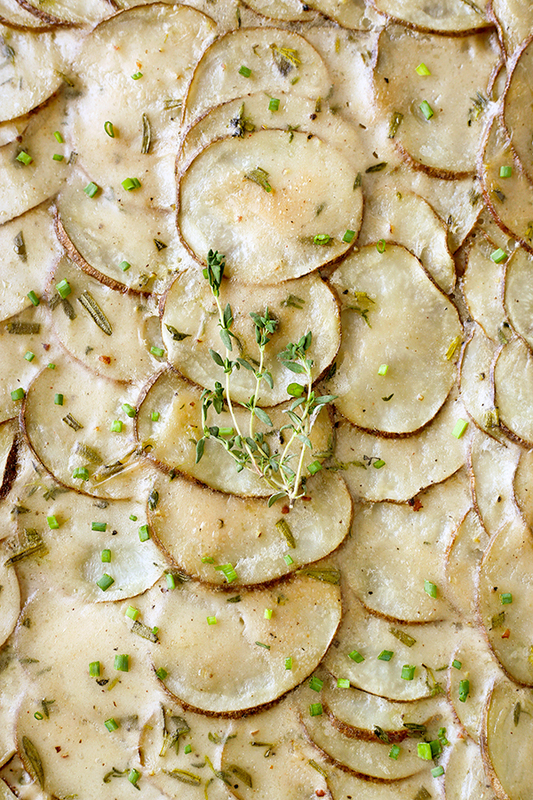 After the layer of potatoes add the sauce and spread as evenly as possible. Continue until all the potatoes have been used and top with the remaining sauce. 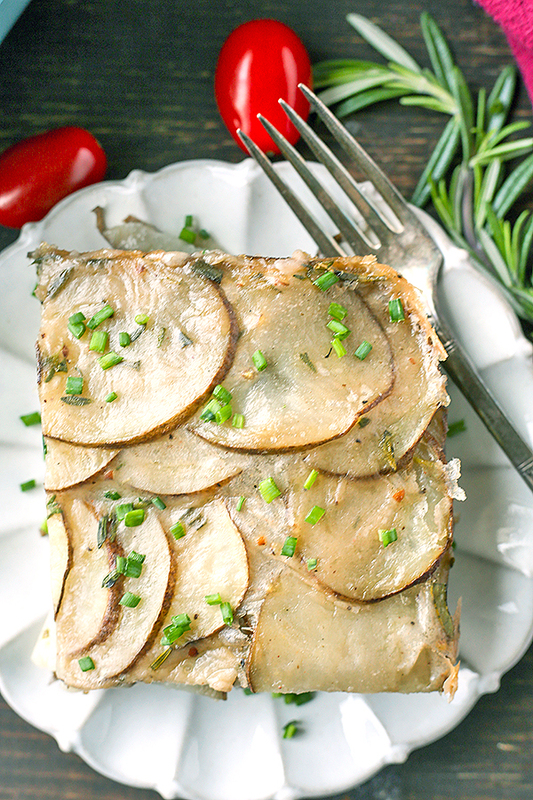 Cover with foil and bake 45 minutes then remove the foil and bake 40-45 minutes or until browned on top and potatoes are tender. *If you don't need it low fodmap, you can use garlic powder in place of the garlic oil. how thin did you slice the potatoes? 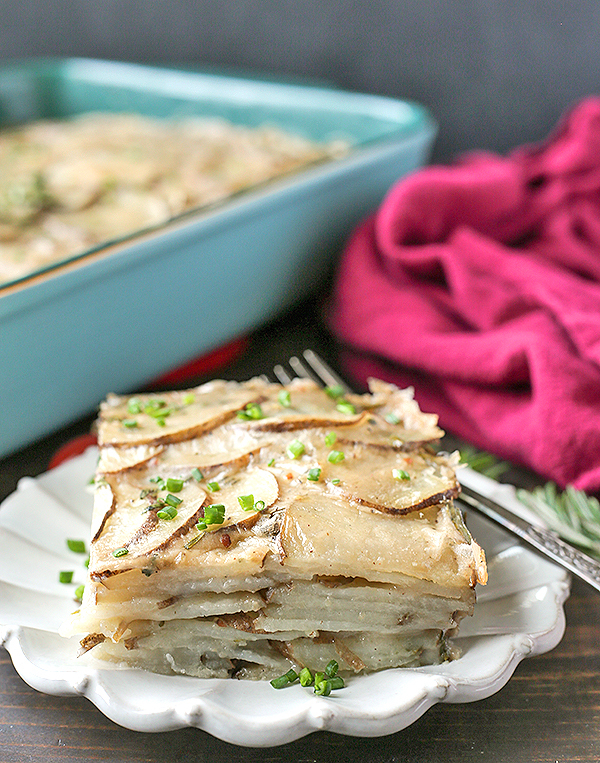 Have you tried making the scalloped potatoes with a flour other than Cassava? The Cassava flour causes many people to have gastric pain and irritation. Thank you. Hi Linda- I haven’t, but you can if you want. Cassava flour is actually one of the easier flours for some people. Feel free to try a flour that works for you.